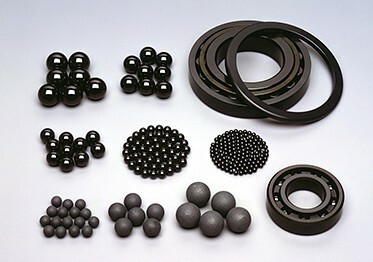 Toshiba Materials' silicon nitride ceramic bearing balls are stronger, harder and more wear-resistant than steel ones, lengthening the life of machinery. 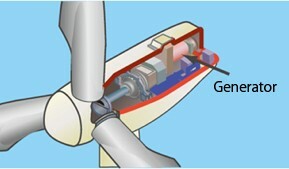 They are also lightweight with less than half the density of steel balls, helping to conserve energy. Silicon nitride ceramic material is an insulator that will not corrode or rust, enabling it to be used in extreme conditions. 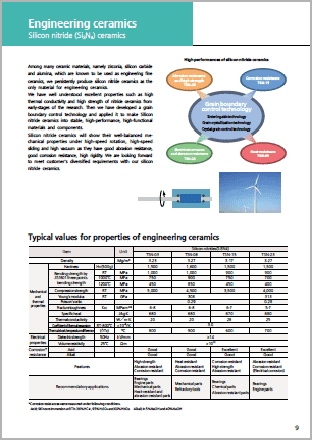 Silicon nitride ceramics have a lighter weight and a greater resistance to wear and corrosion than conventional metal parts. They are used for in-vehicle parts and parts in various industrial machinery parts such as semiconductor manufacturing equipment. 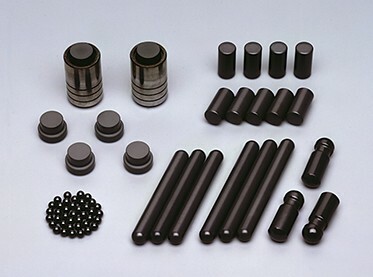 In-vehicle parts to which silicon nitride ceramics are suited include diesel pump rollers which require resistance to wear and baking, and the check ball for fuel injection in diesel engines, which needs to be hard and resistant to wear. The industrial equipment field, meanwhile, makes use of the material's wear resistance, heat resistance and outstanding heat shock performance that prevents it from being wet by molten metal, using it in various tools for semiconductor manufacturing equipment, including center valves, contact collets and masks.